Insane Clown Posse members Joseph Utsler, aka Shaggy 2 Dope, right, and Joseph Bruce, aka Violent J, left speak at a news conference. Throughout their two decades on the charts, the hip hop duo Insane Clown Posse’s over-the-top theatrics and often violent lyrics have put off many listeners. The fact that many of their fans — who refer to themselves as Juggalos — show their devotion with clown makeup and elaborate tattoos has further cemented the duo’s status as musical outlaws. But should they literally be regarded as outlaws? The FBI seems to think so. 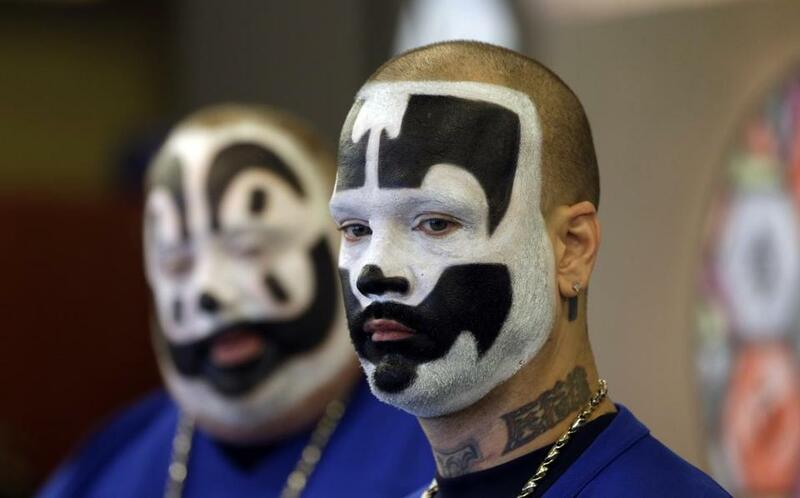 In 2011, its National Gang Intelligence Center categorized the Juggalos as a gang. It’s a loose designation that causes more confusion than clarity, and raises uncomfortable concerns about judging people by their musical tastes rather than their actions. The FBI should be able to fight crime by face-painted villains without tarnishing all the followers of the group. On Jan. 8, the band, along with four self-proclaimed Juggalos and the American Civil Liberties Union, filed a lawsuit in federal court contesting the designation. According to the complaint, being erroneously labeled a gang member has led to Juggalos with no criminal records being harassed by the police. Individual plaintiffs describe being subjected to traffic stops due to their tattoos or Insane Clown Posse bumper stickers or shirts. The gang intelligence center’s report describes Juggalos as a “loosely organized hybrid gang.” However, the same brief goes on to say that the majority of crimes committed by fans of Insane Clown Posse are “individualistic” and “disorganized” and mostly consist of low-level crimes like vandalism and personal drug use. When compared with the activities of other known gangs mentioned in the report, such as Mexican drug cartels, the crimes committed by Juggalos seem insignificant. Given that Insane Clown Posse’s fan base is well over a million strong, it is very likely that some Juggalos have broken the law. It is just as likely that these Juggalos were wearing merchandise or sporting tattoos when they did. The FBI’s designation is meant to provide guidance to law enforcement officials, but in this case the usefulness of the information is more than offset by the harms to people being unfairly stereotyped. Labeling a whole group of music fans a gang because of the actions of a small minority of them is not only unfair — it’s insane.